The announcement of the Samsung Gear S2 and new Moto 360 2 at IFA 2015 was the starting pistol on the second generation of smartwatches. Motorola's first Moto 360 was a hit and its second hasn't been a flop either. Samsung's Gear line has been more miss than hit, but the newest Gear S2 is a fantastic piece of hardware. They're not the high profile Apple Watch, but both second-gen devices have carved out a solid place at the top of the smartwatch podium by figuring out what people like and dislike from the first iterations - much before the days of Apple's wrist-ware. There are still bits and pieces that could be better, of course, but this time around, Moto has created pleasing timepieces that fit both men and women quite well. The Gear S2 is no stranger to fashion either but its really put the fun in functionality with its bezel that makes us love it so. 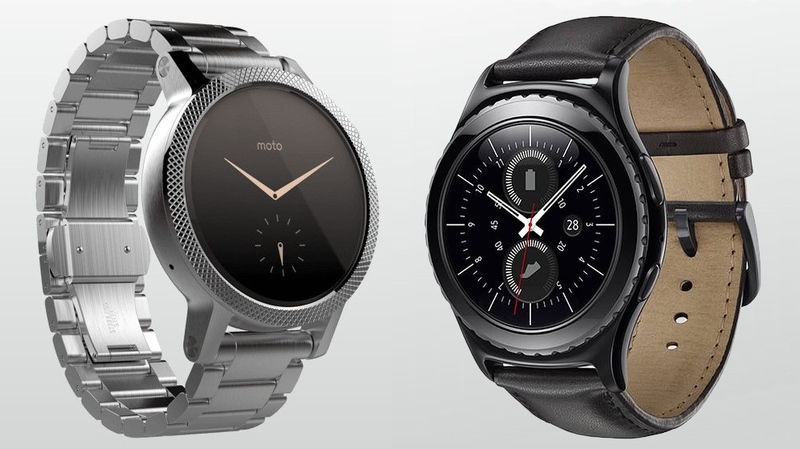 With two great choices, which will it be, the new Moto 360 or Gear S2? The new Moto comes in three sizes, continuing this year's theme of different sized smartwatches for both sexes. There are two versions of the 42mm model - aimed at men and women - and a 46mm version too. It's certainly a visual upgrade on its predecessor, and Wareable contributing editor Sophie claimed that "it's the first Android Wear watch I've put on wrist and not thought it looked a bit silly." The crown has moved to 2 o'clock, the bezels have been refined and the watch has stylish lugs either side of the body to attach the straps. Unfortunately, the flat tire at the bottom of the screen remains. The Samsung Gear S2 takes a different design tact. While it shares a round face, the materials and straps look less dressy and chic than the Moto 360. That doesn't mean it's not a looker, though. While the Moto 360 looks more Omega, the Samsung Gear S2 is more casual, and more like a Swatch. In terms of customisation, both devices feature changeable straps. The Moto 360 comes in Horween leather in grey, black or brown, but it uses a standard attachment. There are also metallic band options. Samsung also offers up three models to choose from: the Samsung Gear S2, Gear S2 Classic and 3G Gear S2. They are essentially the same device, with different finishes. The Classic is black one - with a leather strap - and the regular S2 and 3G models have either a silver finish / white strap or is an all dark grey affair. Unfortunately, there's still no word on whether the UK will get the untethered Gear S2. Also, if you're bored of grey, black and the same old watch faces, Sammy has created rose gold and platinum versions of the S2 to give the smartwatch the elegant edge it needs. The rotating bezel also sets the Gear S2 quite far apart from the Moto, and any other watch Samsung has released. Both visually appealing and functional, the circular bezel provides something the Apple Watch's Digital Crown can't offer: precision and fluidity. You can still swipe around the round face, but turning the bezel lets you choose apps without fail. So while the Moto 360 is the classier option of the two, the Gear's got a neat little trick up its sleeve with that bezel. The 2nd-generation Moto 360 is powered by a quad-core Qualcomm Snapdragon 400 processor, backed up by an Adreno 305 GPU and 512MB of RAM. There's 4GB of storage on board. It packs Bluetooth and Wi-Fi, but GPS is only part of the Sport range. The Samsung Gear S2, on the other hand, smokes the Moto 360 on screen tech with its 1.2-inch Super AMOLED display, with an impressive 302ppi count from the 360 x 360 resolution. Yes, the screen is slightly smaller but the sharper visuals really stand out. Both Samsung Gear S2 devices are IP68 dust and water-resistant and both pack 4GB of storage and 512MB of RAM. They are powered by a dual-core 1GHz Exynos processor. Samsung is promising 2-3 days of battery life from the 300mAh power pack, and you get a night-stand charging dock as standard. The battery in the bigger Moto 360 is 400mAh and 300mAh power pack for the smaller models. Essentially it's a full day of use with the ambient sensor turned on. Like the original 360 - the new models come with a charging dock station in the box. However, it's worth noting that the original Moto - which had a shoddy battery life, uses the same battery sucking processor as the new Moto. It remains a zippy CPU but it doesn't help you charge up less. And finally there's data connectivity: the Samsung Gear S2 will come with a 4G version, which will use a SIM card. This version will also feature GPS, which will be music to the ears of runners everywhere. Being an Android Wear smartwatch the Moto 360 is fairly vanilla, with the usual array of notifications, apps and Google Now, which aims to bring information to you based on your habits. However, Motorola is adding its own features too. Live Dial enables users to individually set dials on the home screen. And activity metrics are measured in the Moto Body software and makes use of the built in heart rate monitor. Again, GPS is key to running and both smartwatches pack the capability, although it will be restricted to specialist versions. The Moto 360 Sport features GPS, as does the 4G version of the Samsung Gear S2. It should be noted that there are precious few details on the latter, including pricing and where it could go on sale. Instead of Android Wear, the Gear S2 uses Tizen. Hands down it's not as good as Android Wear in terms of design, responsiveness and features such as Google Now. However, it is specifically designed for the round-faced Gear S2 and has 1,000 bespoke apps, which means overall the experience could end up being more well-rounded than one-size-fits-all Android Wear. Samsung has also overhauled its fitness app. The S2 isn't going to replace your sports watch, especially as neither the regular nor Classic models have GPS, but there are some attempts to give you that option. The Gear S2 will recognize when you're working out and start tracking straight away. Walking, running and cycling will all be tracked without any input, which is perfect for the kind of casual user who would consider the Gear S2 as an all-rounder. Samsung's health app is also set to build proper profiles of heart rate data, which would in turn make for an exceptionally rich experience. All-in-all, the S2 offers more than Android Wear or Pebble in terms of health and fitness tracking. The second-gen Moto 360 is available for $299.99. Depending on the model, the price gets amped up. Larger Moto's cost $40 extra. The colors available for the Men's collection are Silver, Gold and Black where you'll need to pay $30 more for the Gold case. The Women's collection lets you choose from Bronze, Gold and Silver - with an extra cost of $30 for the latter two. The Gear S2 starts at $299.99. If you want 3G on your wrist, various US mobile carriers are offering different plans with assorted starting prices for the watch itself. There's still no pricing for the higher end rose gold and platinum timepieces just yet. The prices for these smartwatches are fairly similar which isn't a bad thing. Both companies are targeting a mid-range price angle that's still more affordable than Apple's cheapest offering. There's also no huge issues with compatibility here either as Samsung is allowing various non-Sammy flavored phones to use the Gear S2. The Moto does connect up to the iPhone, but it's limited. The Samsung Gear S2 and Moto 360 represent the brightest stars of the second generation of wearables - and choice will likely be split into two camps: ecosystem and sports. Those who hold no affinity to Google or its services should opt for Samsung - but Google Now remains the biggest jewel in Android Wear's crown. Both camps have extensive apps, and while Samsung's is specifically designed for its watch, Google's has a track record of updates and new features. While both offer dressy and sporty designs, which looks best is still a matter of taste. We feel the classic versions look better on the Moto side, and the sport version falls Samsung's way - but others may disagree. In the end, it's a tough call. There's really no pair of watches so evenly matched in terms of design, usage and feel meaning you can't go too wrong with either one.